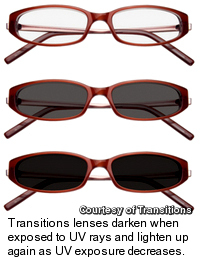 Tran­si­tions lens­es are light-acti­vat­ed lens­es that turn dark in bright light. 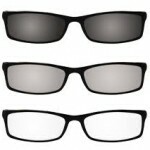 This tech­nol­o­gy has been around for sev­er­al years, but now Tran­si­tions lens­es are avail­able for vir­tu­al­ly all walks of life, from avid out­doors peo­ple to those who spend most of the day inside. Tran­si­tions lens­es pro­tect from UV radi­a­tion, as well as pro­vide a com­fort­able light lev­el for almost all activ­i­ties of dai­ly liv­ing. 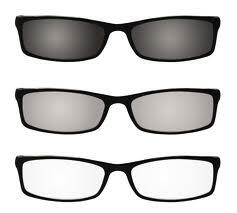 Call us or pop in if you want a demo so that you can “see” the dif­fer­ence that Tran­si­tions lens­es make!